Make it yourself bar will have four shell sizes and 12 creams. PHOENIX, AZ — Holy cannoli! On Wednesday morning, March 20, The Sicilian Baker, a do-it-yourself cannoli bar and Italian bake shop, and the latest concept from Joey Maggiore, the founder behind Hash Kitchen and The Sicilian Butcher, will open its doors. The first 100 people to arrive on Wednesday morning at the Phoenix location and mention "holy cannoli" at the counter will receive a free classic-sized cannoli. Mini cannolis will be passed out throughout the day as long as they're still in stock. "This was a dream come true. Coming from the hometown of Bagheria in Sicily where my family is from, we're known for this," said Maggiore, gesturing to a delectable spread of baked goods and desserts on top of the display case. "Being able to do this was something spectacular that we could bring to the Valley. The first one. And it looks better than we thought it would be." We were given a sneak peek on Tuesday morning. Aside from cannolis, the bake shop will also sell sweet and savory baked goods, like cannolis, arancini (stuffed rice balls), pizzettes, sandwiches and cassatas (Italian cheesecake). View the menu. There are four sizes of cannoli shells: mini, regular, large and the "Sicilian" shell, which is 10-12 inches long. ("It's one a couple people should probably share, Maggiore says with a laugh, adding that they may get some commemorative t-shirts). All the shells are made in house. Some shells are plain, while others have been dipped in white or dark chocolate and coated with toppings, such as confetti sprinkles or crushed Pistachios. They will have 10-12 different creams, including original, chocolate, vanilla, Pistachio, espresso, Italian Funfetti, lemon, strawberry, peanut butter, cookies and cream, and chocolate and mint. Cannolis will vary from $2 for a mini cannoli up to $12 for a foot-long "Sicilian" cannoli. "It's going to be super fun. 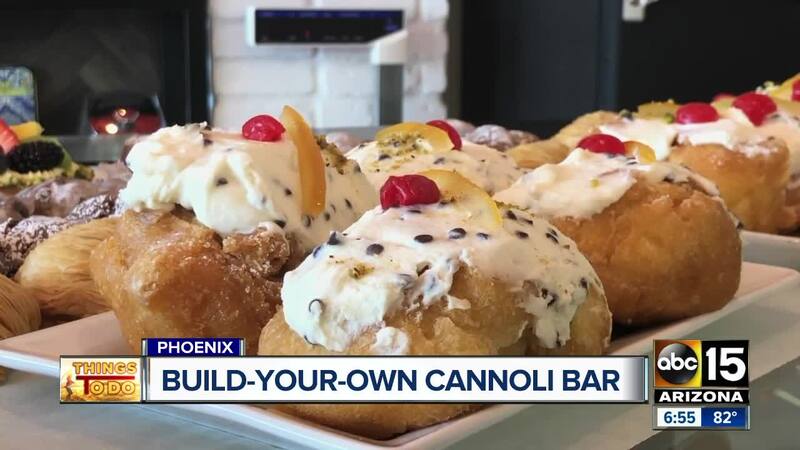 A fun way to come in and kind of have an interactive experience with the cannoli versus just taking them when you go home," he said. It is the first of three locations to open around the Valley. The Chandler location is expected to open in July, Maggiore said, and another will open at Park West in Peoria by the end of the year.